1. The vast majority of family visas – 77% – were granted to the partners/spouses of British citizens or settled migrants. The largest number of grants is to Pakistani and Indian applicants. Some family migrants are more permanent than others – data suggests that the majority of people who enter on partner visas from the Indian Subcontinent have gained settlement after five years, compared to Australians and Americans who have far lower levels of settlement. Any British citizen or settled person wishing to sponsor a spouse must earn a minimum of £18,600, increasing to £22,400 for the first child and an additional £2,400 for each subsequent child. Only permitted sources can be included. Any British citizen or settled person wishing to bring in adult dependants such as elderly parents or grandparents must demonstrate that the individual requires every day care and support and that this cannot be provided in their home country. They must also demonstrate that they have the sufficient funds to care for the individual. 4. There are various types of visa available to people wishing to come to the UK under the family category by way of their relationship with a British citizen or settled migrant. The largest number of visas is issued to partners such as husbands, wives, civil partners etc. The remaining numbers are made up of children and elderly parents and grandparents. 5. 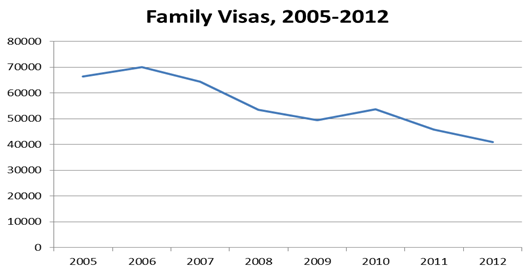 The number of visas for non-EU family members reached a peak of 70,000 in 2006. It has since declined and is at its lowest levels for many years. 6. The top country for all family visas in 2012 was Pakistan at around 7,500. This was followed by India at 3,300 with other significant countries being Bangladesh, Nepal and the United States (all between 2,000 and 3,000 visas). 7. 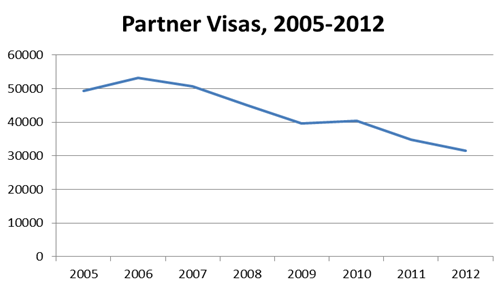 The vast majority of visas issued under the family category are partner visas. In 2006 over 53,000 visas were issued to partners to enter the UK, some gaining immediate settlement. It has since declined to 35,000 in 2011. There was a further decline to 31,000 in 2012 that may reflect the impact of the new salary threshold for overseas spouses (the fall was predominantly in the last quarter of 2012). 8. 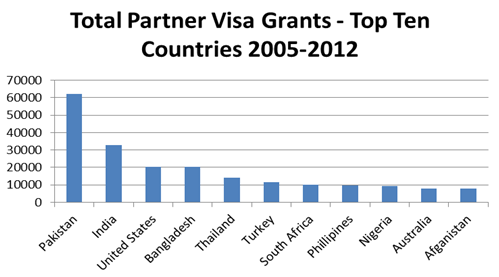 The top country for partner visas in 2012 was Pakistan (almost 7,000 grants) followed by India (2,900 grants), Bangladesh (2,000 grants) and the United States (1,800 grants). Between 2005 and 2012 over 62,000 partner visas were issued to Pakistani nationals. Over half as many (33,000) were issued to Indian nationals. 9. EEA nationals living in the UK can bring in non-EEA partners, children and other dependant relatives on what is called an ‘EEA Family Permit’. The numbers are significant with around 20,000 having been issued to spouses and other dependants each year for the past few years. A non-EEA national on an EEA family permit has a route to permanent settlement in the UK. 10. There is no income threshold to sponsor a spouse on a non-EEA family permit. This is contrast to a British citizen or settled person who must now meet the minimum income threshold of £18,600 to sponsor a non-EU spouse. 11. The Home Office has conducted cohort analysis of inflows to better understand the nature of different types of migration. In its Migrant Journey, Second Report, it found that, of those family migrants admitted in 2004, 55% had been granted settlement by 2009 and a further 8% continued to have a legal right to remain. However, within this there were variations by nationality. For example, after five years the report found that 81% of Pakistani nationals who came in 2004 under the family route had gained settlement, as had 70% of Indians. However just 10% of Australians had gained settlement, (with three quarters having no valid leave to remain) and 30% of Americans. Therefore family migration is more permanent depending upon nationality, with family migration from the Indian Subcontinent being largely permanent in nature. 12. The new income threshold of £18,600 to sponsor a non-EU spouse appears to be impacting on the number of spouse visas granted. The government will also begin interviewing more spouses to ensure that the relationship is genuine and that no element of pressure has been exerted on either partner. The Migration Advisory Committee examined a sample of partner applications and found that 40% did not meet the minimum income threshold required to sponsor a spouse. However, assuming a 40% reduction in partner visas would be to overstate the effect since people naturally will adapt to changes. We anticipate, therefore that in 2013 and beyond partner visas will fall to between 20,000 and 25,000. Other family may account for around 5,000. 13. The Migrant Journey showed that around two thirds of migrants granted family visas remained in the UK legally after five years, over half of whom had gained settlement. This broadly means that around two thirds of family migrants will contribute towards net migration in the longer term. However, the new minimum income threshold of £18,600 is likely to disproportionately affect migrants from countries such as Pakistan and India. As these migrants show a greater propensity to remain in the UK – 81% of Pakistani and 70% of Indian family migrants were granted settlement within five years according to the Migrant Journey report – it is likely that the proportion of migrants who settle will fall from two thirds to perhaps a half as the number from Pakistan and India falls. Net migration of family members is therefore likely to be around half of the 20,000-25,000 visas issued annually in the medium term or around 15,000 as an upper limit. This is less than the current number of EEA Family Permits (paragraphs 9 and 10 above) and underlines the need to negotiate an opt out from the relevant EU Directives. The level of the minimum salary should also be kept under review. Migration Advisory Committee, Review of the minimum income requirement for sponsorship under the family migration route, November 2011, URL: http://www.ukba.homeoffice.gov.uk/...c/family-migration-route/family-migration-route.pdf p. 72. Home Office Immigration Statistics January to March 2013, Entry Clearance Visas Volume 2, Table be_06_q_f. Migration Advisory Committee, Review of the Minimum Income Requirement for Sponsorship under the Family Migration Route, November 2011.